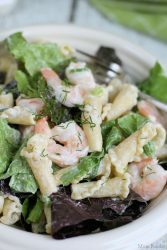 Cucumber Ranch Shrimp Pasta Salad is a perfect cold entree on a hot summer day. Cook the dry pasta al dente. While the pasta is cooking, remove tails from shrimp and ensure they are well de-veined. Drain pasta, and rinse quickly with cold water. Make sure the pasta is very well drained, then pour into large mixing bowl. Add remaining ingredients and mix will. While chilling at least 1/2 hour is ideal, the dish can be served immediately.